Sorry. No Deluxe Rooms are available on the selected dates. Sorry. No Standard Rooms are available on the selected dates. 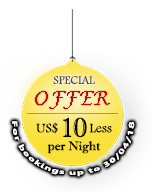 Click here to indicate that you have read and agree to the booking terms and conditions..